What motivated you to start DJing/presenting? I was actually picked up by a local DJ at the age of 18 when he heard a mix tape of Chicago House whilst I was buying food at a road side burger van of all places. He was standing by my car listening, dressed in a white suit and I thought he was trying to nick my car until he revealed who he was. He offered me an opportunity to become a trainee DJ and I ended up with a residency which lasted 3 years. Pirate radio was the natural progression during the early 90’s and didn’t really look back. I started out playing with house and club classics for several years before migrating to Trance in 1994. I’ve played every style of trance over a 12 year period including Euphoric, Italian Hardstyle and Psytrance. 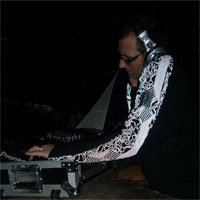 From 2006 I crossed over into minimal techno, using my real name Colin Newbery to differentiate the music change. Over the years my style gradually crossed genre boundaries to form a more deep tech progressive sound. I’ve now gone full cycle and back spinning Trance showcasing the first decade from 1991 in my Euphoric Evolution shows using my original Twync name. Do you mix or scratch or both? Or are you more of a presenter? Strictly mixing for me, I’m an avid vinyl collector and avoid scratched records. You make your conclusions from that. Do you play on just one of danceradiouk.com’s stations or both? Just Dance UK at present. Outside of danceradiouk.com, who are your favourite DJ’s, bands or music artists and how have they influenced your style (if they have)? I’ve always had a secret love for eighties synth bands and early electronic music growing up but no favourites in particular. Never really had a favourite DJ as I’ve met most whilst working as a music column journalist for a clubbing magazine during the nineties and the majority I met were so… how should I say egotistical? The best guys I met away from the decks were Carl Cox, Darren Pearce and John 00 Fleming, total legends. What other interests do you have besides DJing/presenting on the radio? I also produce music with several releases through Boomtic Records (plug plug) and my wife is a Techno DJ so music is always a major factor at home. Our Roberts radio is playing morning noon and night. We have a new home so plenty of blood, sweat and tears have gone into this over the last few years and oh yeah restoring our old Golf GTI sitting in the garage for the summer. My wife, my home, my life. Sum yourself up in a sentence? Still got fuel in the tank and places to go! Now That’s What I Call Music! back catalogue…. and a match. Desert Islands get cold at night. The Dance Radio UK network is run and funded by our team of volunteer DJ’s and loyal listeners from around the globe. We rely solely on donations to pay our annual license fees and keep the music flowing, so if you think you can help us please click the Donate button below. Every donation is appreciated, no matter how small. 2 hours of classic trance beats with Twync from 8pm (UK time) tonight here on Dance UK. Dance Uk Radio at www.danceradiouk.com shared a post. Monday trance fix required anyone?